I was delighted to spot a little man, decked out in Alpine clothes and straw hat, catching some sunshine on the roof of 79 Piccadilly. Just around the corner, leaning on the balustrade, I discovered he had an identical friend. It was surprising to find that there’s no real information online about the figures and so I considered taking the story in another direction; talking about the O.K Cafe that also occupies the building downstairs and the history behind the name. Historically the Okasional Cafes were squats, social centres for anarchists and environmental activists and in recent times a demonstration in the benefits of non-profit community spaces. In fact if you’re reading this at the time of publishing then you can go and check out the Castlefield OK Cafe right now. It seems to make a lot of sense to use an otherwise empty space for a community project, but I don’t know enough about the economy or politics to go into that and the mystery of the little men was too intriguing to leave alone. 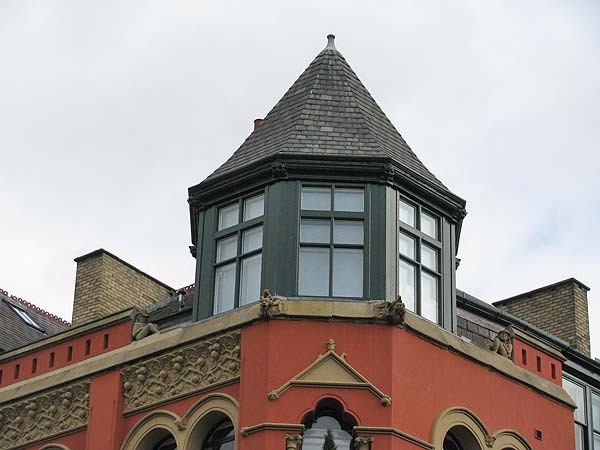 Built in 1877, the original architects of the building were Clegg and Knowles. The duo were prolific architects who specialised in grand warehouses, the likes of which were admired by tourists who would travel to Manchester during the industrial revolution to marvel at the ornate and unusually tall warehouses of Manchester (the warehouses and mills were built upwards to offset the expensive land rent. As an indication of the success and growth of the period this was during a time in which Manchester’s population trebled in the space of 39 years. During the same time period London’s population had only doubled). After the completion of The Atheneum, considered one of the most inspirational buildings in Manchester’s architectural history, the general building trend of the time followed suit and ‘palazzo’, an elegant Italian Renaissance style build, was born. So why then is 79 Piccadilly so different from the norm? "We have no idea about their origin or what prompted the architect to incorporate them, although the fact that he chose an ‘Alpine; style for this building would explain why the figures appear to be Swiss or Austrian"
The Manchester Pevsner (an architectural guide to the city) has very little information other than to reiterate how the conventional architecture present up to the eaves suddenly makes a radical change of direction. Given that the Pevsner covers almost every building you can imagine it’s not surprising that it doesn’t go into too much detail. I contacted the author, Clare Hartwell, to see if she had any further information or thoughts on the little men. It seems they are as much an enigma to her as they are to everyone else, although she did suggest that they could possibly be a later addition to the original build. What Clare also suggested was to look through the trade directories of the time and they might in turn point me towards the occupants which could provide a clue. The trade directory is a 596 page, scanned document and there are 3,339 returned results for ‘Piccadilly’. I think I found an entry for number 79 but the copy is blurred and I can’t be sure it’s correct. The occupants were Hunter’s Manufacturers and subsquent to that, in 1894, one occupant of the building was a Mr Wormald Mann (a commission agent who helped organise the lease of a mill for a wealthy Cumbrian family). Here I reach a dead end. "I am not naturally of a skeptical or suspicious cast of mind. I have eaten sausages and kidney pudding without asking questions but when I was told that this was only a warehouse I felt this it was necessary to draw the line of credulity somewhere"
So, is that all it is? Did Clegg and Knowles simply embrace the loosening of the rules? It seems odd, and unfullfilling after all the research, to think that they simply got a little bit Laurence Llewelyn-Bowen on us. Maybe the manufacturers were Austrian and wanted that to be reflected in their premises, maybe not. Clare Hartwell of the Pevsner seems to think it’s more than a quirk in design and that the client would indeed have had a hand in the decision to use the little men, but who can really say for sure. These two roof dwelling men and their unusual home have left most of Manchester puzzled but if anything they might have encouraged you to look up at the buildings around you to see what unusual discoveries you can make for yourself.